The basic idea of having balanced Scorecard Rating is that complex issues need to be adressed and evaluated. Therefore the a broad overview and specific context is requried. 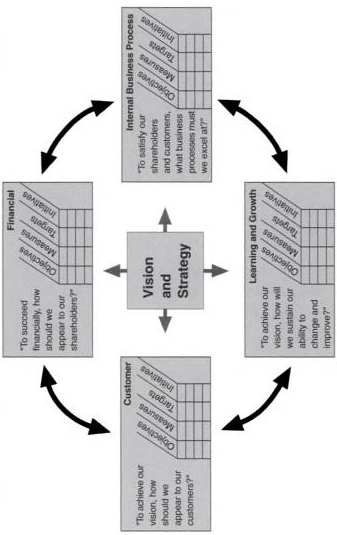 The Book “Balanced Scorecard” is a great ressource for gathering detailed information. 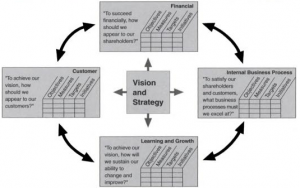 The overview of “Vision and Strategy” for Balanced Scorecard. Practically, the Balanced Scorecard can be seen as an integrated Projectplan or Measurementplan. In the Most basic Case, this Plan is structured in the form of “Task, Responsible, Deadline”, grouped into Milestones. Management using the Score-Card Method is a systematic and integrated approach.